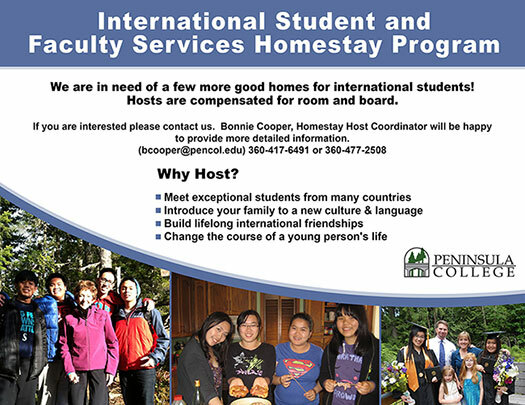 Peninsula College offers international students two options for housing; Homestay and Off-Campus Apartments. Our helpful staff will assist you with both options and take care to help you select the best option for your lifestyle. Our Homestay Coordinator carefully selects warm and welcoming Homestays to satisfy students' desire to learn English, introduce them to the beauty of the Olympic Peninsula, allows opportunities to participate in household activities, and help our students learn life skills to become more independent. Student satisfaction with their Homestay experience is one of our top priorities. Invitations to be included in family activities. Peninsula College refers students who wish to live off campus to a local apartment management source. Students can choose apartments with one or more bedrooms. Meals are not provided with the off-campus apartment option. Most apartments are located within a short distance from Peninsula College and are accessible by bus. To check available listings, visit Properties by LANDMARK Inc. or Port Angeles Rentals.